Published by Fax +49-69/450464/R&S Records. Licensed from Fax +49-69/450464 cat # PW 07. Manufactured and marketed by R&S Records/Belgium. Originally released on CD in 1993. Ambient goes philosophy, and you cannot say which supports the other more in this case. This really is exceptional music, music that transcencds itself to reach the spheres of philosophy - I venture to say that, having studied philosophy for two semesters, and being in awe of Friedrich Nietzsche lately. Friedrich Nietzsche is the author of the work that is being recited on the central track "Gebirge" - the work in question is Nietzsche's "Thus Spake Zarathustra", and what we can enjoy here is chapter XXIII The Child with the Mirror. As the title of the track suggests, this is a massive piece, despite its Spartan layout. You are made to feel the existential loneliness of Zarathustra / Nietzsche in the cold, indifferent and yet ultimately consoling mountains, the all-knowing eagle watching from even farer above and shrieking, shrieking. 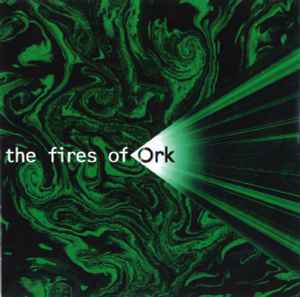 You have left the swirling "Fires Of Ork" to enter the pure mood of sobriety in the "Gebirge", to tersedly invoke the stars there (where else? ), contemplate "The Facts Of Life" after having come so far, having been cleansed, and return to the pounding fires that you came from. It's a demanding journey which is worth the while, because it leads you back to strength. No doubt we can stand in awe of the musical artist who made this possible, just as well as Nietzsche!